Were Getting Ready to Race!! Not all the Zoomers are here yet, but it won't be long! Bob and Carl, with help from Paul, have been putting some finisihing touches on the decks and around the track..we still need to have a work party to re-stain the decks and ramps and another load of dirt and a work party to touch up the track itself. Hope we can fit it in before the December Holidays.. Check out the latest video below. Bob donated an electric lawn mower and some lo-o-o-ng extension cords and spends many hours watering, mowing and triming the turf on the slopes around the edges of the track. Bob has taken on the job of "Grounds keeper" and may have his eye on the Track Steward's job as well. It has been pretty busy at the track this summer. Tall Paul and Patty ran their cars every night until they left for the north country at the end of July. We have been running under the lights most saturday nights from sunset (around 7:30) until our batteries run down. We most often have 6-8 cars on Saturday night and have two new couples who have been regulars on Saturday. We have 8 stations in the fence for race marshalls to step onto the track during official races. We dont want to encourage spectators to get on the track while a race is being run without assigned marshalls. 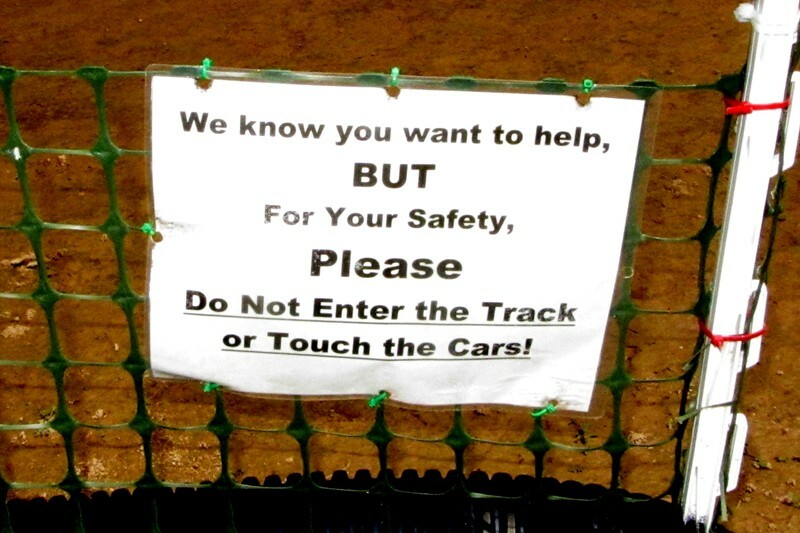 If a car flips over or gets hung up, the driver yells out "CAUTION" and everyone stops their car while the driver runs down to the track, rights his car and returns to the deck. Then he/she says "1,2,3,GO" and we start racing again. A litle bit awkward, but it works..for fun racing anyways! Winter Texan Zoomers are starting to trickle back in...C'mon Down Y'all! Check out Peter Gray's latest RC build...turn your speakers on! This is the Team Associates Model RC10T4.2 truggy that the race committee is promoting as a racing class for next season. 1. It will be a "spec"-class, meaning everyone will run the same truck manufacturer, tires, body, controller, etc. All cars will be the same mechanically and electronically. Any modifications to the running gear must be approved and will have to be applied to all cars if approved. The car is a Team Associates Model RC10T4.2 with a brushless motor. Each cars performance, in relation to all the other cars in the class, will depend on the drivers ability to drive, tune up, and maintain the car, not on expensive "hop-up" improvements. 2. The cars will run in a separate class, and will not be run with any other 2WD classes. 3. This will be an "Open" class for drivers that are in the PRO and SPT classes, no rookie ZOOMERS. Once a driver progresses out of rookie ZOOMERS, they will be allowed to enter the Truggy "Open" class. During the off-season this summer, we have 5 or 6 of these truggies racing at night on a more or less regular basis. We hope to have another half dozen or more join in the fun when the regular racing seaon begins. The cars all look pretty much identical when they come out of the box. We all happened to get the blue color scheme and under the lights they all looked the same except for our car numbers. When we are all bunched, especially in the back straight, its hard to keep track of which care is really yours! But now we all will know which car is Bob's!! Li Po Batteries should not be stored at full charge for more than a day or so. They should be stored at half charge, around 3.8 volts per cell. Your lipo charger will have a "storage" setting that will bring a discharged battery up to 3.8 volts, or discharge a full battery down to 3.8 volts. Before leaving the park on 4/19 I charged my LiPo batteries to full charge and put them in my fire resistant safe thinking they should be stored like any other battery around. Well, since we travel slowly and took almost three weeks to get to Ohio, I never looked at them. To my surprise, my Traxxas LiPo batteries were all swelled when I went to use one. Going to the local hobby store I was told that these batteries should never be store more than 10 days or two weeks at the most at full charge. A call to Traxxas also confirmed this. There is no info in any Traxxas printed material that comes with these cars about storage of these LiPo batteries. There is a way to discharge these batteries on the Traxxas chargers. Perhaps something could be put on the web site about this. left for up north !! A snapshot of the latest work session on the track! 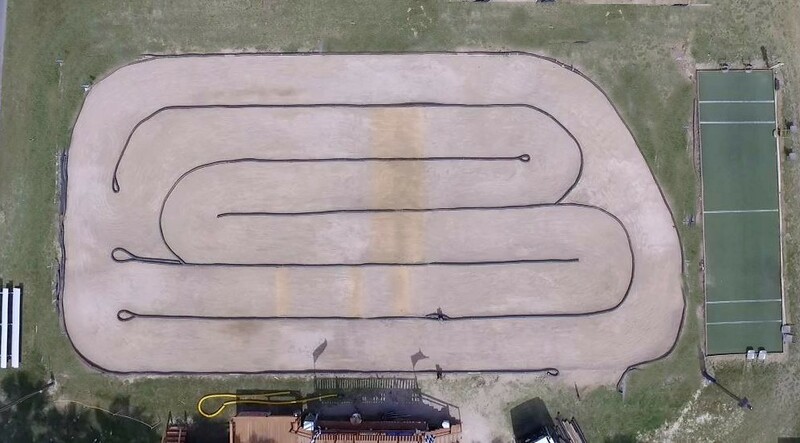 A Drones-eye view of the new layout and another drive around the track with Carl. Watch as he makes his way thru traffic.